Watch wales and dolphins from the deck in this beachfront holiday home. Watch dolphins from the living room whilst relaxing with a glass of wine. 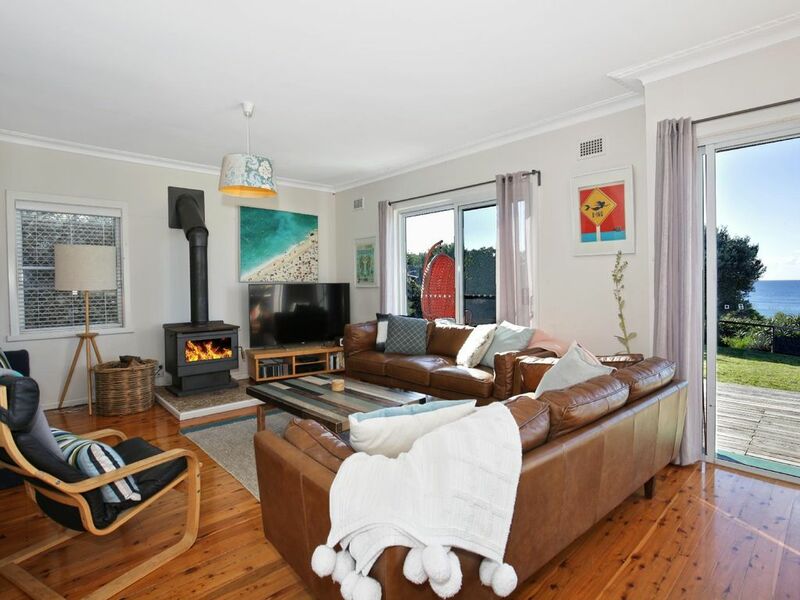 Perfect for family accommodation making this charming, spacious and an absolute beach front Self-contained cottage located in the quiet and beautiful neighbourhood of Culburra Beach. An amazing place for a family, couple or group accommodation to stay - Culburra Beach House will give you all the space and privacy you need. This beach house comfortably sleeps up to 14 people and has beach access. We even welcome your furry friends. Spa bath and wood fire enhance your holiday. Culburra Beach is a great sleepy seaside town and fishing village with surf beach and access to 2 great lakes, headland and lighthouse. Only 3 hours from Sydney and located 15 min east of Nowra, Culburra is the perfect destination for a family accommodation or a weekend away. The luxury villa when hired comprises of water on all sides, it's a popular surfing, fishing, kayaking spot and also known for its excellent oysters. This group accommodation in Culburra is a small seaside town and a popular holiday, fishing and surfing location. Local industries include oysters, shrimp, and prawns. It has two surf beaches, Culburra Beach and Warren Beach. The town is flanked by the Crookhaven River to the north and west, and Lake Wollumboola to the south. It is home to the Culburra Dolphins Rugby League team and the Culburra Cougars soccer team.The town also boasts the two closest surf beaches to Nowra and is home to the Culburra Beach and Nowra Surf Club whose a clubhouse is located at the northern end of Warrain Beach. The beaches are patrolled during the summer holiday period, and being located on either side of Penguin Head face in different directions, providing a variety of surf conditions for board riders, swimmers, body surfers and families with young children. A wide variety of fish species is caught on these beaches and from the rocky headlands adjacent to them. 5 Bedrooms on absolute Beachfront which sleeps 14 people. Great layout suitable for multifamily stays with adults rooms off to sides of the house and bunk rooms off the middle of the house with views from open plan kitchen/living /dining areas. Onsite parking available for 3 cars. The property is in a superb location. It is neat, clean and tidy, spacious and very comfortable with a well equipped kitchen. Good secure fencing, front and back, kept our 2 dogs out of mischief. From the photos Jenny's beach house looks amazing yet staying there exceeds the photos heaps. Listening to the waves even in bed and watching the ocean while cooking is special. The house has plenty of fridge space, spacious dishwasher, wooden fire truck to play with, blankets for the chilled night, plenty of table ware, and functional yet cosy interior. Definitely a place one would like to come back to! Little trouble with the dishwasher runners but otherwise a delightful stay. Such a relaxing house felt we were a million miles from care. Kids young and teen were perfectly content here for days, other than a trip to the tree tops adventure climb in Nowra one day, we didn't leave at all. Thanks for having us! Fabulous location with generous facilities and equipment. Owners are very good at maintaining the property. We would have no hesitation in recommending this house for a stay in what is a beautiful part of the world. We had a lovely stay here - the view is incredible and the house is in an idyllic location, with a short path directly to the beach at the end of the garden. We saw whales from the balcony on the first day! Highly recommended! We had a wonderful stay. Once everyone had claimed their room, everything we had forgotten was there, the dog had a wonderful time pottering around the garden and running along the beach and all up it was everything we had hoped it would be. Only word of warning would be to bring good mosquito repellent for the mornings and evenings. We will definitely be back! !